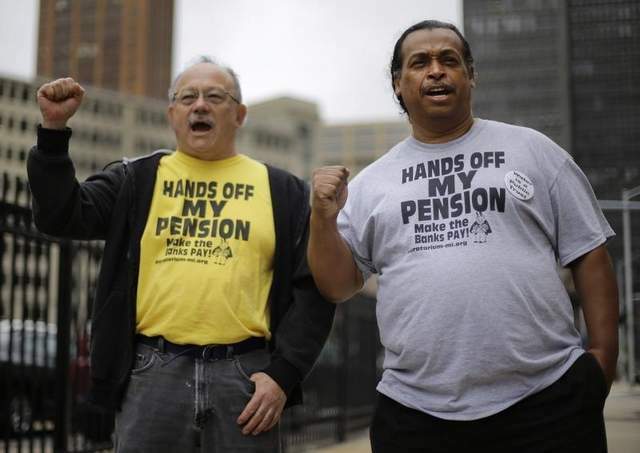 Detroit-style pension cuts: could it happen here? Bankrupt Detroit announced last week that current workers and retirees voted overwhelmingly to cut many pensions by 4.5 percent and to trim or eliminate cost-of-living adjustments. If the plan to exit bankruptcy had been rejected, a federal judge might have imposed a proposed 27 percent pension cut, and a $816 million contribution to offset pension cuts would not be made by foundations, the state and art donors. “I want to thank City retirees and active employees who voted for casting aside the rhetoric and making an informed positive decision about their future and the future of the City of Detroit,” the Detroit emergency manager, Kevyn Orr, said in a news release. Retirees in a much smaller bankrupt city, Central Falls, Rhode Island, population 19,000, voted in 2011 to accept pension cuts of up to 55 percent, reduced for the first five years by a state supplement. In California, pension debt is an unresolved issue in two cities that declared bankruptcy in 2012 about five weeks apart — Stockton on June 28 and San Bernardino on Aug. 1. But the state law in California and the financial pressure on the two cities, both members of the California Public Employees Retirement System, are different from the situations in Detroit and Central Falls. Only 27 states have laws authorizing municipal bankruptcies, a Pew Charitable Trusts report said last July. Two states, Georgia and Iowa, prohibit bankruptcies, and the rest have no law authorizing or prohibiting bankruptcies. Michigan Gov. Rick Snyder appointed an emergency manager for Detroit finances, Orr, who proposed a 27 percent pension cut. A court-appointed Central Falls receiver, Robert Flanders, proposed pension cuts of up to 55 percent. Elected city councils still control Stockton and San Bernardino finances. Stockton does not want to cut pensions, saying they are needed for recruitment. San Bernardino has only publicly proposed stretching out pension-debt payments to reduce short-term costs. In addition to outside control, Detroit and Central Falls also received outside financial aid that reduced the amount of the pension cuts active and retired employees were asked to approve. The $816 million Detroit “grand bargain” reduced pension cuts and avoided the sale of the city’s world-class art collection. Private foundations provide $366 million, the state of Michigan $350 million, and Detroit Institute of Arts donors $100 million. The Central Falls pension cut of up to 55 percent is reduced during the first five years by several million dollars from the state of Rhode Island. Police and firefighters get 75 percent of their original pensions. Pensions of $10,000 a year or less are not cut. Because the state of California helps fund schools, a state fiscal oversight system requires county offices of education to monitor school districts, the Pew report said. For some troubled districts, the state has appointed administrators and provided loans. The ruling that federal bankruptcy law allowing contract impairment overrides state law was appealed by unions. But the early ruling, along with potential loss of “grand bargain” financial aid, may have added to fear of deep pension cuts, influencing the vote. A cut of 4.5 percent in active and retired general worker pensions and the elimination of cost-of-living adjustments was approved by 73 percent of voters. Leaving police and firefighter pensions intact but trimming their COLAs from 2.25 to 1 percent was approved by 82 percent. In a brief supporting the appeal of Judge Rhodes’ ruling, CalPERS argued, among other things, that Detroit has a city-run plan and that an “arm of the state” like CalPERS cannot under federal bankruptcy law be impaired in a municipal bankruptcy. The judge handling the Stockton case, U.S. Bankruptcy Judge Christopher Klein, has said one of his options is ruling on the general issue of whether CalPERS pensions can be cut without necessarily finding that Stockton pensions should be cut. Although differing on pensions, the Detroit and Stockton plans to exit bankruptcy are similar on retiree health care. Detroit announced last week that a 90 percent cut in retiree health care was approved by 88 percent of voters. Judge Klein ruled in 2012 that retiree health care can be cut in bankruptcy, acknowledging the result may be “tragic hardships” for some. A Stockton retiree health care debt of $544 million was reduced to a one-time payment of $5.1 million. Another similarity is that the Detroit and Stockton “plans of adjustment” to cut debt and exit bankruptcy face challenges from bondholders. Making little or no reduction in massive pension debt, but deep cuts in bond payments, is said to be unfair. In Detroit, a “grand coalition” of the city, retirees and major unions reportedly has formed to fight a challenge to the exit plan from two bond insurers, Financial Guaranty Insurance Co. and Syncora. A trial on confirmation of the plan is set to begin Aug. 14. The city argues that a $1.4 billion loan in 2005 to fund Detroit pensions used bogus corporations and a third-party trust to skirt a state limit on borrowing. The bond insurers suggest that if the loan was illegal, the pension funds should return the money. “Experts tracking the largest municipal bankruptcy in U.S. history view a potential disgorgement of the debt as a long shot — but it could be enough of a threat to nudge Detroit to strike a settlement with the insurers simply to avoid the risk,” the Detroit Free Press reported last week. Stockton reached an agreement in closed-door mediation with three bond insurers, all city unions and other major creditors. But the city could not reach agreement with two Franklin bond funds that loaned $35 million, triggering a confirmation trial last month. This month Judge Klein set a value of $4 million on the Franklin loan collateral, two golf courses and a park. He invited the city, CalPERS and other parties to submit briefs on how pension debt should be treated before the next hearing Oct. 1. Stockton followed a union-backed law passed after the Vallejo bankruptcy that requires a 90-day mediated attempt to reach an agreement with creditors before filing for bankruptcy. San Bernardino made an emergency bankruptcy filing, saying it needed an immediate stay of debt collection to make payroll. Then San Bernardino took the unprecedented step of skipping its CalPERS payments for one year. Last month San Bernardino announced an agreement with CalPERS to pay off the debt for the skipped payments — $13.5 million, plus several million more in interest and penalties. San Bernardino does not yet have an exit plan. U.S. Bankruptcy Judge Meredith Jury is scheduled Tuesday (July 29) to hear a firefighter union request to argue in state court that the city imposed benefit cuts that violate state labor law.